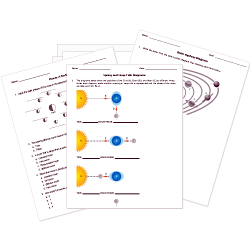 You can create printable tests and worksheets from these Kindergarten Astronomy questions! Select one or more questions using the checkboxes above each question. Then click the add selected questions to a test button before moving to another page. a planet with a moon. stars that form a picture. How long does it take Earth to revolve around the Sun? For the world to go through day and night, has to be spinning. The Moon can be seen sometimes in the daytime.